Mt. 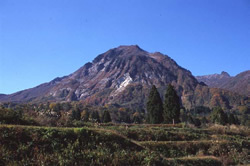 Gongendake (1,104m) lies just in front of the peak of slightly larger Mt. Hokogadake. It is named for gongen, which in Japanese religious beliefs refers to a spiritual avatar or manifestation of a Buddha sent to guide the Japanese people. 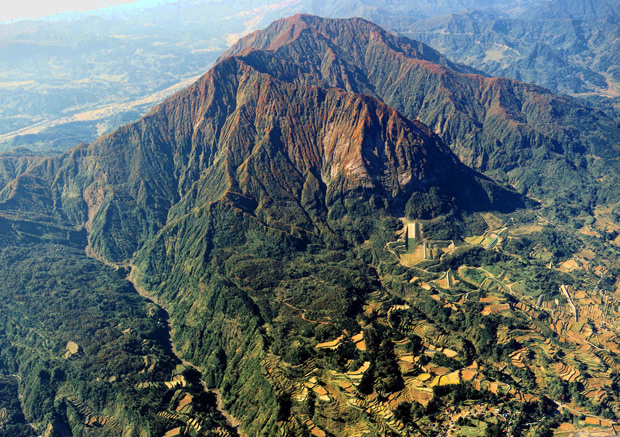 As you might imagine from its name, this mountain is revered as an object of worship. From a geological perspective, it is formed of porphyrite intruding through the Neogenic rocks of Fossa Magna with many well-developed platy joints and small faults throughout. Here, in 1947, the famous Maseguchi Landslide struck, prompting the first postwar studies of landslides in the country. There are many natural gas wells in this area which the local communities take advantage of for cooking and heating. Also common to the area are hot springs, resulting in a number of hot spring resorts. Micro-earthquakes are also quite frequent in the intrusive rock beneath Mt. Gongendake. In January of 1986, an avalanche struck the community beneath this mountain, damaging houses and killing 13. 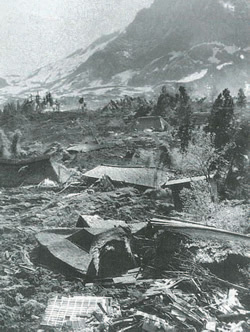 The avalanche poured through a trench created by the 1947 landslide. 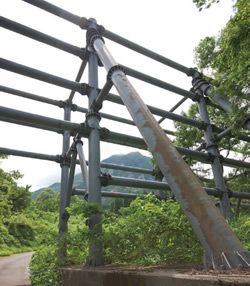 Since then, a large avalanche protection fence was built and can be easily observed. The natural gas, hot springs, earthquakes, landslides, and avalanches characteristic of this geosite appear to be the result of magma intrusion and the continued protuberance of Mt. 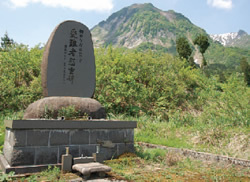 Gongendake. About one million years ago, magma bubbled up from below the earth, collecting in shallow areas and hardening into a stone called porphyrite, forming the bulk of Mt. Gongendake. A beautiful mountain which stands out distinctively from the other mountains around it, it's no wonder that it became an object of worship for the people around it—the word 'gongen' means an avatar of the gods, which this mountain was believed to be. A deposit of firn, or permanent snow, can be found on this mountain. In the days before refrigeration, this snow was used by the local people for preserving fish and treating fevers. After a catastrophic avalanche in 1986 caused massive damage to the villages below, steps were taken to protect the local communities. These massive fences work in tandem with avalanche deflecting dams and walls to prevent snow from collapsing into the valley below. Near the peak of Gongendake, a number of narrow vertical grooves are visible. These grooves, called avalanche trenches, are formed by the erosion effects of countless avalanches in winter and rain in summer. The grooves are most easily visible from near the fields of permanent snow. While Mt. Gongendake is famous for its terrible avalanches, it also blesses the valley below with a great number and variety of hot springs. 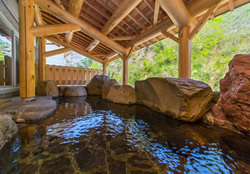 The Maseguchi District is home to several hot spring baths and inns. This commemorative stone was erected in memory of those affected by the 1986 Maseguchi Avalanche. On the 26th of January 1986 at about 11pm, 200 meter wide avalanche started at an elevation of about 850m up the slope of Mt. Gongendake. This avalanche rushed 1800 meters down to the village of Maseguchi where it caused massive devastation, resulting in the death of 13 villagers. 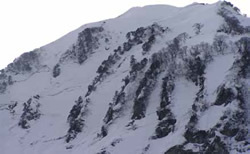 The first avalanche to strike Maseguchi, it traveled along the path of the previous landslide of 1947 at a speed of about 50 meters per second. The Maseguchi Landslide was an enormous landslide 1.5km wide and 2km long which began on the 19th of May 1947. It destroyed 114 buildings, of which 53 were houses, and caused massive destruction to the rice fields in the area. The landslide moved very slowly, only about 10-15cm per hour over the course of two days, so there were fortunately no human casualties. 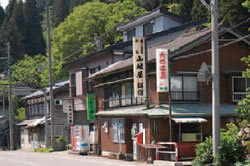 The Maseguchi Hot Springs District is home to a number of hot spring inns including Gongenso, Taigakuso, and Yamashiroya. Nestled in the mountains, yet a short drive from the sea, these inns all offer spectacular menus using a variety of fresh, natural ingredient, making them incredibly popular among visitors and locals alike. They are great places to relax after a day of mountain hiking or skiing.